Miami, Florida - Bald One Media, an innovative new mobile application developer, is excited today to announce the recent release of AppSketcher for the iPad and iPad 2. With no end in sight to the growing mobile app space, AppSketcher gives app users with the next great app ideas the opportunity to easily draw up and conceptualize their own titles. Eloquently designed, and simple enough for anyone to use, the app allows users to design their own freehand app mockups or wireframes with digital ink and share them with friends, family, or app developers right on their iPad. AppSketcher is currently available for download on the Apple App Store for $2.99 in the Productivity category. 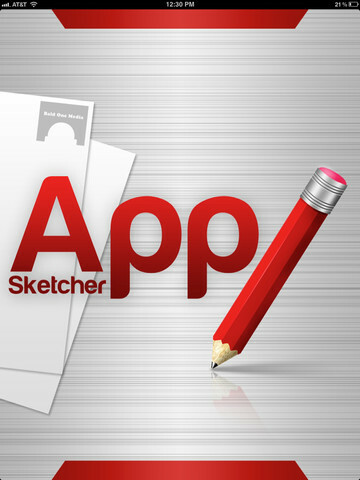 Originally thought up by app developers hungry for a free form app sketching solution that would allow them to easily organize and share new ideas, AppSketcher was built from the ground up to be both practical and accessible. The app provides users with a digital "pen & paper" approach, where they can sketch how they envision their apps' screens to look by hand without any formal restrictions. To help ensure that users stay on target, AppSketcher includes a number of pre-designed templates which emulate the screen formats and dimensions of today's most popular mobile devices. Among them are templates for the iPhone, iPad, as well as, other platforms. AppSketcher gives users the choice of using a wide array of ink sizes, styles, and colors to draw up their ideas. Boasting a highly intuitive interface, the app enables users to focus on creation and innovation above all else. Once their wireframes and mockups are finished users can save them right onto their iPad's Photo Library, export them to their Dropbox account, or email them anyone they'd like. With AppSketcher the app conceptualization process takes mere minutes and never leaves the digital arena your ideas are geared towards, its as simple as that! AppSketcher 1.0 is $2.99 USD (or equivalent amount in other currencies) and available worldwide exclusively through the App Store in the Productivity category. Founded in Miami, Florida, Bald One Media is a mobile solutions developer focused on creating app titles across a wide array of genres. Whether building business facing applications or "how to" solutions, the organization is committed to bringing mobile consumers into greater harmony with their devices. (C) Bald One Media 2011. All Rights Reserved. Apple, the Apple logo, iPhone, iPod and iPad are registered trademarks of Apple Inc. in the U.S. and/or other countries.